Preheat oven to 450° F. Add 1 tablespoon of oil to preheated skillet (high heat). When oil is hot, add onions and bell peppers and sauté until lightly browned. Remove onions and bell peppers and reserve. Add remaining oil to hot skillet. Add steak and quickly sauté until seared. 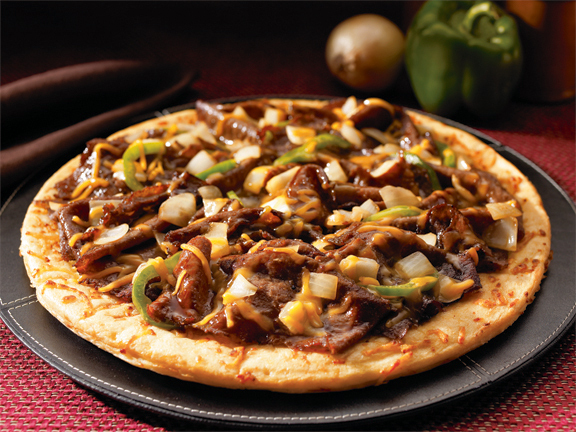 Fill pizza crust with beef, onions and bell peppers. Salt and pepper to taste. Sprinkle with cheese. Bake 8 – 10 minutes on a baking sheet in the lower third of the oven. Serve immediately.